Play on the lower tea-ground lawn at the Fowey Hotel has continued throughout the summer despite the wet weather. The occasional balmy afternoon when playing has been enjoyed by us all. Our triumph in the Short Croquet Tournament at Nailsea on Easter Day resulted in Fowey being promoted to the First Division for 2008. Our B league team have played five matches this season winning three and losing two matches. Our wins were against Torbay (away) Plymouth (home) and Exeter (home): the losses were Cornwall (away) and Budleigh Salterton (away).On each occasion a team of four played and these have been made up of the following players: David Edwards, Barry Edwards, Reg Wapling, Rosemary Bradshaw, Margaret Read, Stephen Read and Tony Jennings. 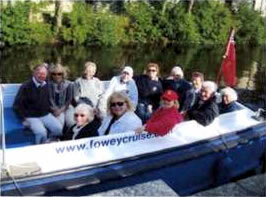 Congratulations to Fowey as they have made a very good entry into the South West Federation's competitions. Our home matches were played at Porthpean by kind permission of Cornwall Club. The preliminary matches for this event resulted in David Edwards and Stephen Read leading for the Golf Croquet but they were unable to attend the Area Finals at Nailsea. This took place during the first weekend in August. Hopefully, we will try again next year. Reg Wapling will be going forward to the Area Finals for the All England Association Handicap Championship at Nailsea on 1st and 2nd September - so our good wishes to Reg! This began with an excellent Cream Tea with Strawberries at Janet Howard's home, Myrtle House, on the 18 June '07. The sun did break through that afternoon so Janet was able to serve tea in the garden. It was an enjoyable occasion and thank you to Janet. A boat trip to Lostwithiel took place on Wednesday, 1 August '07 and again good fortune was on our side as the evening was warm. Twelve members set out (see the picture below) and those of us who rarely travel by boat to Lostwithiel enjoyed the changing landscape and the greetings from other boat travellers. The fish and chip supper was also very good (a real treat!) and with 'extra' picnic beverages this proved to be a very sociable evening - thank you again to Janet. Morning Breakfast, 9am, at the Royal Fowey Yacht club. The breakfast will be followed by a game of croquet for those wishing to play. Barry Edwards is kindly organising this event so thank you to Barry and please send her your slip/ cheque by Wednesday, 29 August '07. Following the Breakfast will be a Safari Supper on 29 October '07. This will begin at Rosemary's home where we will enjoy the starter followed by the main dish at Janet's, Myrtle House, and the dessert course at Owen's, 49, Esplanade. Return slip/ cheque should be sent to Janet by Monday 1 October '07.